LBMC Technology Solutions' IntegratorPlus streamlines business processes and eliminates manual re-entry of customer and order data with pre-configured integration between Microsoft Dynamics CRM and Sage Intacct. 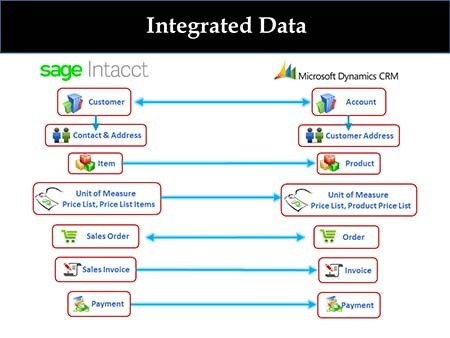 Extend your cloud-based financial management and customer relationship management (CRM) solutions by delivering pre-configured integrations between Microsoft Dynamics CRM and Sage Intacct with IntegratorPlus. If you have made the investments in Microsoft Dynamics CRM and Sage Intacct consider maximize your return on those investments by automating processes through integration. LBMC Technology Solutions offers an integration tool for Sage Intacct and Microsoft Dynamics CRM to drive improved business productivity. IntegratorPlus is a subscription-based cloud solutions built on the Microsoft Azure Platform that allows users to harness the power of both Microsoft Dynamics CRM and Sage Intacct. Critical data, such as customer, customer address, inventory, pricing, sales order, and sales invoice information, can be transferred so that updates in one system will instantly update the other. Eliminate the maintenance of paperwork and manual processes, redundant customer data entry, inventory, pricing, sales order information in multiple systems or Excel spreadsheets, and streamlining order fulfillment and customer service processes. Make it easy for sales executives to verify pricing and submit sales orders while at their desks or on the road without leaving Microsoft Dynamics CRM. Orders they submit in CRM will automatically be created in Sage Intacct. Automatically update Microsoft Dynamics CRM with the latest billing and payment information from Sage Intacct. Save time and money by streamlining the processing, reporting, and transaction times for your finance and revenue teams. Dramatically improve collections and cash flow by providing your sales team with real-time financial information about customers from within Dynamics CRM. IntegratorPlus can increase productivity by as much as 30%. Learn more here. IntegraterPlus offers clients many key benefits, such as the automatic, two-way synchronization of customer and sales data, for financial, operational and business development analysis anytime and anywhere. As a Premier Sage Intacct partner and Microsoft Dynamics CRM certified partner, LBMC Technology Solutions is uniquely positioned to assist you with your Intacct and Dynamics CRM integration. Watch the video to see how IntegratorPlus integrates data between Microsoft Dynamics CRM and Sage Intacct cloud accounting.